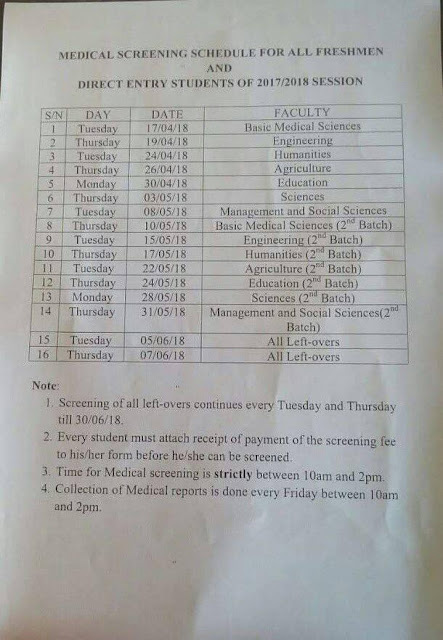 The Federal University Ndufu-Alike Ikwo, FUNAI Medical Screening Schedule for all Freshmen and Direct Entry Students for the 2017/2018 Academic Session. 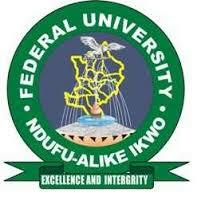 Authorities of the Federal University Ndufu-Alike Ikwo, FUNAI has released the Medical Screening Schedule for all Freshmen and Direct Entry Students for the 2017/2018 Academic Session. Screening of all left-overs continues every Tuesday and Thursday till 30/06/10. Every student must attach receipt of payment of the screening fee to his/her form before he/she can be screened. Time for Medical screening is strictly between 10am and 2pm. Collection of Medical reports is done every Friday between 10am and 2pm.